A wok is a round cooking utensil that can be used to prepare different dishes. Originating from China, it has slowly become a kitchen staple all over the world- and with good reason. Woks are versatile, allowing for quick and tasty meals that can be made all in one dish; similar to a crockpot, but better, as you sear meats and create a variety of textures. Really, there is nothing you can’t do with a wok: stir-frying, steaming, poaching, boiling, stewing, braising, roasting nuts, making soup- you crave it, you can make it. This type of cooking utensil is made with different materials, but the most common is carbon steel. The best carbon steel woks are affordable, lightweight, heat up quickly and are durable. This review summarizes the 5 best Carbon Steel Woks, educating you about their different features and styles. We’ll also break down the various types of woks and give you buying tips to ensure you choose which one is best for you. 2 What is a Carbon Steel Wok? 12.1.1 Q: Does the carbon steel wok work well with ceramics stove tops? 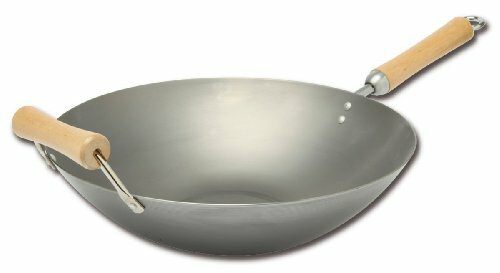 12.1.2 Q: Do I need to use a wok ring with fat bottom woks? 12.1.3 Q: How often do you season it? 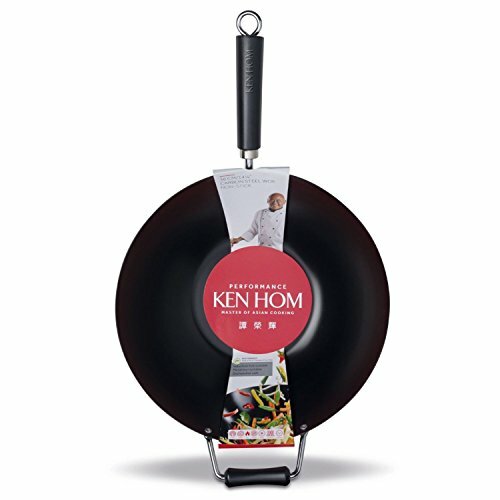 We highly recommend KEN HOM Non-Stick Carbon Steel Wok because it is made with non-stick, PFOA-free coating inside out, so you don’t have to worry about it scratching. The brand is solid and it’s worry-free. Carbon steel woks are the newer sleeker version of the original cast-iron wok. Made from a blend of carbon and steel, they are light and easy to handle, which is important when creating stir-fry meals. In addition, the blending of these 2 materials allows for quicker and more uniform heating and durability. They will not break if you drop one, are relatively inexpensive, and if you use them correctly they will form a natural non-stick surface. The Ken Hom wok is not only affordable, it is made by one of the world’s leading experts in Asian cooking and authentic Chinese cooking. This product consists of nonstick coating inside and outside of the pan so you don’t have to worry about food sticking or scratches. Its 14.25 inches is sizable enough for you to make dinner for your entire household. The pan has stay cool handles made out of durable plastic and iron, and at 3.6 pounds this wok is lightweight, so lifting is a breeze. The nonstick coating inside the wok may come off. However, this issue is covered by the two year guarantee. What customers love most about this product is how well constructed it is and also the fact that it is non-stick. The non-stick aspect of this pan makes it easy to clean up as food hardly sticks to the pot. And the best part is that it is dishwasher safe. Joyce Chen’s wok is impressive, with Birchwood handles that stay cool during cooking and a 1.5mm gauge carbon steel body. Lightweight and easy to manage while on the stove, this wok has a flat bottom so it works well on gas stoves, electric stove tops and induction ranges. Another bonus is the curved sides of the pan makes stirring and tossing in stir-fry cooking easy and fun. With this wok you can also deep fry, steam and simmer your foods. This wok heats up well so your food will cook the way it should. For full flavoring the pan should be seasoned before it is first used. Tt is also part of the classic series by Joyce Chen. It has multiple uses, i.e. simmer, deep-frying, steaming etc. 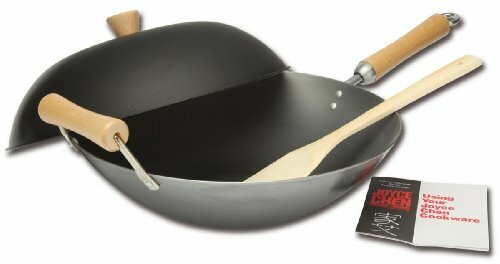 This 14 inch carbon steel wok set is flat bottomed, which helps distribute heat evenly. With 1.6 mm carbon steel it is sturdy and durable, heats up quickly and can be used on both electric and gas stovetops. It features a high domed lid, that allows for steaming, along with wooden, heat resistant handles. The pan has a long handle and a loop handle, while the domed lid has a wooden stay cool knob. This product should be seasoned before use. The 14″ wok is big enough to make a family dinner, but can also be used by individuals. It’s a little heavy for some customers. Customers who have used this product like that they don’t need pot holders to lift this pot as its wooden handles stay cool. They also love the combination of the long handle and the little helper handle. Which makes it easy for them to work with the pan. This four-piece wok set is made up of a 14-inch carbon steel wok, 12-inch bamboo spatula, nonstick steel dome lid and a recipe booklet, giving you everything you need to create meal after meal. Safe to use on electric and gas stovetops, its wide top and narrow bottom make it possible to fry with less oil. Made with 1-1/2 mm gauge carbon steel it heats up fast and evenly, for meals that are thoroughly and perfectly cooked. As with other carbon woks, this item should be seasoned before use. Hand washing is recommended for this cooking pan and it should also be dried before storing. This product makes an ideal gift as it comes in a gift box. This wok does not withstand high heat as their cooking got burnt. Customers who purchased this product love that it is light-weight which makes lifting a breeze. They also confirm that as long as the wok is properly seasoned before use, it will produce good results and cleanup is easy. This affordable USA made pan is made of 14-gauge carbon steel, has a blonde long wooden handle and a loop helper handle on the opposite side. This wok is fun and easy to use, with a flat bottom that sits comfortably on both gas and electric stovetops. Its sturdy padded bottom heats up quickly, retains heat and is durable, so you get your money’s worth. The shape makes it easy to move food while stir-frying and it is easy to season. This carbon steel wok should be hand washed and seasoned before it is used and re-seasoned when required. Some customers complained that It did not sit flat on their glass top cookers. However, this product is not even recommended for glass tops. Most customers love that this wok can be used on any range of stove top because of its flat bottom design. They also love its padded bottom of steel as it helps the wok hold heat very well. Carbon steel is the most popular choice of woks because it heats up quickly, transfers heat evenly, produces its own nonstick coating and is affordable. However, there are factors to consider when choosing a wok. If you use a gas stovetop, either a rounded bottom or flat-bottomed wok will perform well. However, if your cooker is electric or an induction range, you should go for the flat-bottomed style because it will sit comfortably on top of it without wobbling. The height and diameter of the product should be considered. Also, check its concave properties. If you get one that is too deep, the heat will be retained in the bottom and the transfer of heat to the sides will not be adequate and result in uneven cooking. On the other hand, if it is too shallow you will not be able to move and toss foods up the sides. The ideal diameter should be a 14-inch pan with a minimum of 5 inches for the flat-bottomed ones, and a depth of 4 inches. Woks come with different handles: some have a long handle on one side and a loop handle on the other side, some come with two small loop handles opposite each other, while others simply have only one long handle. All the handles serve the same purpose: to lift the wok up. Choose your wok based on your preference and technique. Some woks are sold individually while others come in a set that consists of a lid, ladle, burner rings steamer tray, spatula, etc. Decide what you will use the wok for before you choose one. Besides stir-frying, there are other options like steaming, smoking and deep frying and all these will require extra pieces for successful cooking. These pans sustain a lot of wear and tear, and although they should last longer than 10 years it is recommended that they should be replaced every decade. Every kitchen should have a wok. Whether you are steaming, stir frying, stewing or deep frying this cooking pan has several benefits. Lightweight which makes it easy to lift and toss food. Carbon steel woks are generally lightweight lifting up your pan while cooking is easy with carbon steel woks. This sturdy built carbon steel wok is made with non-stick, PFOA-free coating inside and outside the pan, so cleanup is easy and you don’t have to worry about it scratching or rusting. It weighs 3.5 pounds and has a dimension of 24 x 14 x 4 inches. The Helen Chen’s kitchen wok set comes with a domed metal lid, measuring 19 x 14 x 10 inches and weighing 5 pounds. This item is made out of 1.6 mm carbon steel and has wooden handles, so you are guaranteed durability. It is also compatible with electric stoves and gas. This item is made of 1-1/2 mm gauge carbon steel, so cooking is fast and heat distribution is even. It has two Birchwood handles that stay cool, for easy cooking and manipulation. With its nonstick steel dome lid the heat, moisture, and nutrients of your food are contained, for optimal cooking every time. This product dimension is 23.2 x 14 x 5.6 inches and it weighs 5.7 pounds. Made with heavy 14-gauge carbon steel, it has a dimension of 13 x 10.5 x 6 inches and it weighs 7.5 pounds, this is a sturdy product. This wok also consists of a wooden side spool handle and a flat bottom to allow it sit comfortably on an electric stove or a grill. This design will only sit comfortably on a gas stove top. If used on an electric stove top it will tip. Who are you buying for? Is this a gift for a single relative or coworker or a mom of four kids? Who is using it will determine the size of the wok. There are many sizes to choose from and getting the right one is important; if its too small they’ll spend too much time cooking multiple servings and if it’s too big you may pay more when you don’t have to. What does it come with? Many brands come with recipe books, utensils or extras like a steaming plate or deep fry rack. You may get a better value for your money and the extras can help make cooking easier. For instance, some come with a special whisk for cleaning. Flat or round bottom? What you cook on is the best way to determine if you get a flat or round bottom. Round bottoms can reflect heat, so they are not recommended for electric stoves. Flat bottoms are good for electric and gas so check if you are giving one as a gift. Wash your wok with soap and water and scrub thoroughly; then place it over a flame and let it get hot. To test it flick it with water- if the water evaporates it’s ready to go. Once it is heated take it off the flame, let it cool a moment and then add a little oil (maybe a tablespoon); swirl it to coat all the sides. Now place it back on the stove and add some seasonings; I recommended some scallions and ginger. Reduce the heat to medium and let them cook 15-50 minutes, being sure to move them all around the sides too; when the color of the wok changes from silver to yellow/brown (there can also be hints of blue, black or bright yellow) it’s seasoned. Put it back over the flame and let dry for a minute or 2. If there is any residue use paper towels to remove. Deep-Fry: If you use a larger wok you can deep fry dumplings or chicken wings without any oil splashing. Smoking: Place a rack in the wok and put smoking material under it to make tasty smoked meats or nuts. Roasting: Using dry heat and a lid you can roast food such as chestnuts or other tasty treats. Braising: You can create excellent sauces, reducing liquids as you make meals such as sesame chicken or other delightful concoctions. 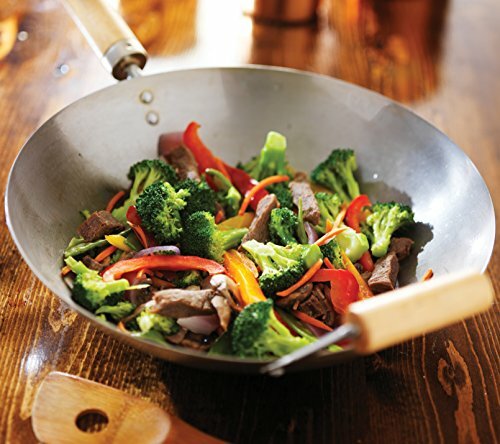 Stir-Frying: Most people think of stir-fry when they hear wok, as it is what it is most commonly used for. You can make lo-mein, fried rice and other succulent meals using this technique. There are 2 styles of cast iron: Chinese and American. Chinese models are much thinner than the American models, but both develop excellent seasoning so food doesn’t stick. In addition, cast iron is known for retaining heat, so once it gets hot it will maintain it’s temperature for longer. It can be used with metal or wood utensils and you can sear, crown, sautee or biol liquids in it. Plus, allows for quick cooking time. On the downside, Chinese cast iron is quite brittle and can easily chip or break. Also, since cast iron heats quickly it is easy to have food overheat, so you must be vigilant. 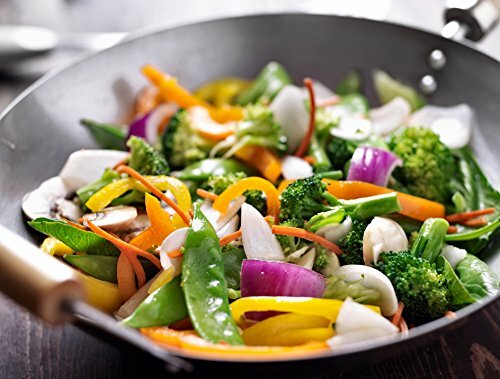 Usually made of steel, this type of wok is sprayed, baked, or coated with a non-stick material such as Teflon so food won’t get caked on or burn. Non-stick, for the most part, is not worth the hassle. To begin, since they do not contain carbon or cast iron they do not become seasoned so food lacks complex flavors you usually find when using a wok. Also, since foods won’t stick, they also won’t brown or sear, so you can’t get a crisp outside on meats. While this allows for food to stay tender and juicy, it minimizes textures. Finally, the non-stick material can chip or flake over time, so you must be careful and only use plastic or other soft utensils. Factor in that non-stick woks cost more than carbon steel and cast iron, you are better off with one of the other styles. Aluminum is great for spreading heat evenly, but due to its internal properties, it also has a tendency to lose heat quickly. Aluminum is usually thin and can easily become damaged. Anodized aluminum is stronger and holds heat longer, but still can’t compare to carbon or cast iron. These woks should be seasoned before use. It should also be hand washed and dried properly with a towel before storage. The wok should be oiled with a paper towel after washing and drying. Woks have the tendency of developing rust spots. When it is oiled and stored, it is protected from rust. Q: Does the carbon steel wok work well with ceramics stove tops? A: Yes it does. This type of wok can be used on virtually and stove top, from electric to gas or ceramic. Q: Do I need to use a wok ring with fat bottom woks? A: No flat bottom woks sits squarely on any stove top. You can manipulate them as you cook, allowing for even heating as you go. Q: How often do you season it? A: You should season it after every use. As you season your wok it will build up a natural non-stick surface and also enhance the flavors of whatever you cook. In conclusion, woks have to be used for a period of time before they develop their deep patina and non-stick coating. When the wok is new or hasn’t been used many times, the seasoning could feel gummy, develop rust spots or look splotchy. This shouldn’t bother you. All you need to do is keep cooking and when you have cooked with the wok for long enough, the patina will develop. 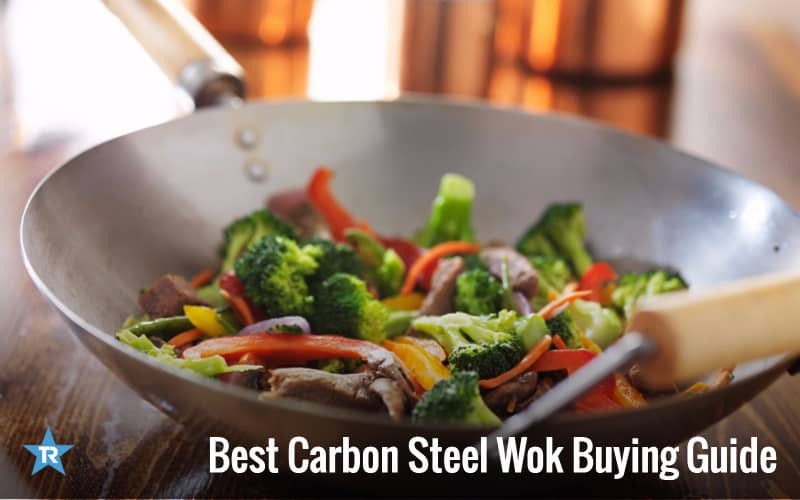 With these 5 best carbon steel woks review choosing one for your kitchen should make easy.